Club-Mate is a non-alcoholic beverage composed mostly of yerba mate extract (0.4 grams per 100ml), sugar and caffeine. Originally called Sekt-Bronte, this unusual drink has been brewed in the German town of Dietenhofen since 1924. Sometime in the 1950s it changed it’s commercial name to Club-Mate, but sales remained restricted to regions around Nüremberg and Würzburg. In 1994 the brand was acquired by a Bavarian beer brewery and distribution expanded beyond the Bavarian borders to all regions of Germany. Shortly thereafter, Club-Mate became known as the drink of hackers, since it’s peculiar energizing effect was hugely sought after by those who had a habit of staying up all night working on the computer. Recently, it has also grown popular within the Hipster community. When Loscher brewery began to increase production, the key to their success was word of mouth. Hackers supplying their homes with bottles and more bottles of Club-Mate and various alternative youngsters began mixing Club-Mate with rum, vodka or Jaegermeister in bars and nightclubs. The Club-Mate fan base began to grow with each international convention of hackers, who then returned to their countries with the news. Gradually Club-Mate began to be exported and today it can be found in more than thirty countries including not only Europe but also Canada, Australia, USA or South Africa. Why hackers love Club Mate? 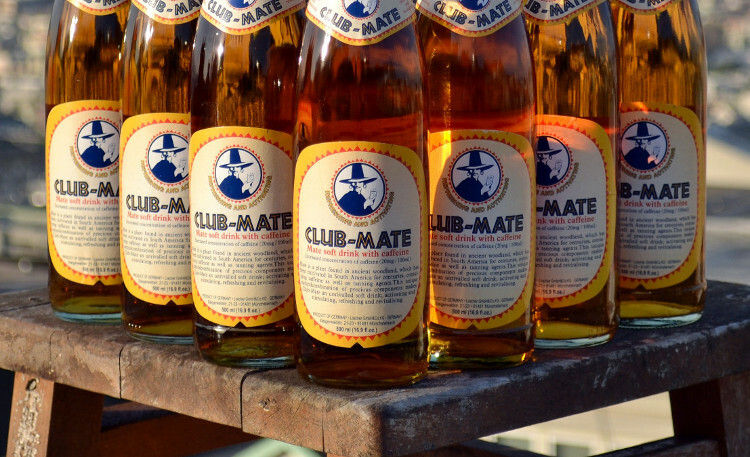 Kristof Partyka is the sole distributor of Club Mate in the United Kingdom. He claims to always have a gourd of “real” yerba mate on his side when sitting long hours in his office to process orders. Like the “real” yerba mate, Club-Mate is also an acquired taste. Those migrating from Cola and Red Bull might have a hard time getting used to the mate mix at first. So there you have it. If you happen to stumble upon Club-Mate during your next trip to the supermarket, why not give it a try? I have tried it myself and will have a review coming out really soon, so look out for that!